The entire festival will take place in the city centre from 17-20 March. Ralph Murphy, from Cobh during the Dublin St Patrick's day parade last year. 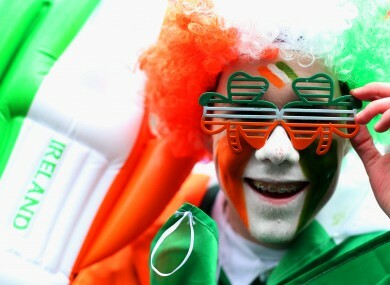 DUBLIN’S ST PATRICK’S Day festivities will carry the theme “Imagine If…” this year. The full schedule will see a three-year programme of past, present and future-themed parades come to a close. The entire festival will take place in the city centre from 17-20 March, with the parade on the big day kicking things off. This year, as part of the I Love My City programme, the festival presents a schedule including The Moth StorySlam; an open mic storytelling competition where storytellers put their names in a hat are selected at random to tell a story on the spot on the night’s chosen theme. The event will take place in the Teelings Distillery, New Market Square, Dublin 8 on Thursday 17 March. Tickets are €8 each. There will also be look-see Run, a teen-centred project that offers an alternative tour of Dublin, The Children’s Soapbox; in which children explore their hopes and dreams for Ireland in soapbox-style performances using spoken word, stories and poetry. Tours on look-see Run will take place at 6.30pm and 8.00pm on both Friday 18 and Saturday 19 March meeting at Hugh Lane Gallery. Tickets are priced at €5. The Children’s Soapbox will take place on Friday, 18 March in The Ark Children’s Cultural Centre. Tickets are free and available from 7 March. There will be screenings of the landmark documentary Older than Ireland, which tells the story of a hundred years of a life as seen through the eyes of thirty Irish centenarians. A special screening and interview with some of the stars will take place at 2pm on Saturday 19 March at The National Gallery of Ireland. People are also invited to get their dancing shoes on and join the Festival Céilí taking place on Friday 18 March to dance their way into the night at Ireland’s largest outdoor celebration of traditional Irish dancing. Sunday 20 March brings the Festival Big Day Out at the heart of Georgian Dublin with Merrion Square providing the setting for a day-long street carnival. It will feature performances, open-air shows, music, fun zones, workshops, arts and craft, Irish language events and more. This year’s St Patrick’s Parade creative theme, Imagine If, is looking to the future, and over the past months we have been collaborating with children, young adults and some fantastic leading Irish pageant companies to bring this vision, that marks this seminal year for Ireland, to life, in a creative and artistic way. Email “Here's what's happening in Dublin for St Patrick's Day”. Feedback on “Here's what's happening in Dublin for St Patrick's Day”.